"Elective Foot & Ankle Surgery | Ocean County Foot & Ankle Surgical Associates, P.C." 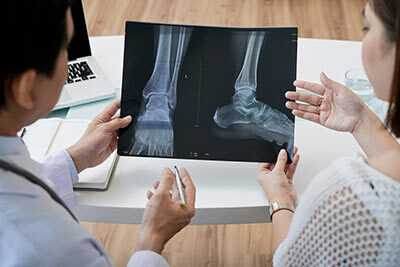 Foot surgery may become necessary for numerous reasons, including a severe injury or foot-related condition that doesn’t respond to other forms of treatment. If you or a loved one needs foot or ankle surgery, Ocean County Foot & Ankle Surgical Associates, P.C. is your local trusted provider of podiatry care in New Jersey. Our dedicated team of board-certified foot and ankle surgeons has performed all types of surgical procedures for over 20 years. A bunion is the result of a deformity of the big toe, often caused by an inherited trait of the foot. Bunion removal may become necessary if nonsurgical treatment methods don't relieve your pain. We correct bunions through specialized surgical techniques. Hammertoes are another type of deformity, characterized by toes that are permanently bent and caused by a muscle/tendon imbalance, ill-fitting shoes or trauma to the toe. These deformities often start out mild and progressively worsen over time. While surgery isn’t the first option for treatment, there are surgical options that can straighten toes, improve the toes' appearance and function, and alleviate pain. Neuroma syndrome is a thickening of the nerve tissue between the third and fourth toes, which causes pain, tingling, burning or numbness in that area. When the ball of your foot becomes painful to the point it interferes with walking or other activities and nonsurgical procedures haven’t provided relief, surgery often involves simple neurectomy to remove the affected nerve tissue. Posterior tibial tendon dysfunction occurs when an inflamed or torn posterior tibial tendon can't provide stability and support for the arch of your foot. This dysfunction often leads to flatfoot condition. Our talented foot and ankle reconstructive surgeons perform surgical procedures to fix the tendon and reestablish the arch.